Khun Pairat Srivilairit, "Nui", Head of Internal Audit TISCO Finance, presents Baht 55,000 check to Khun Pattira on the occasion that TISCO will become TISCO BANK. 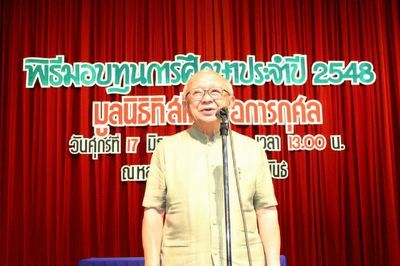 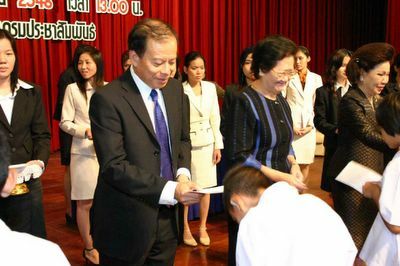 The sum represents Khun Nui's accumulated teaching fees received from Chulalongkorn University and the the Association of Internal Auditors, and donated to the Foundation according to TISCO's "Code of Conduct". 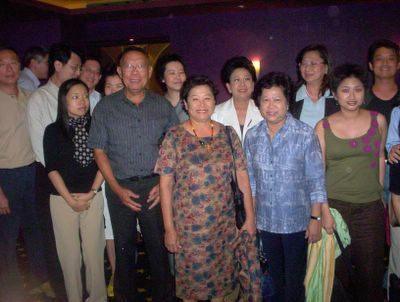 "Mahalai Muerng Rae (Tin Mine)" Movie - Khun Sukree Kaeocharoen, former President of the SET, and his wife, Khun Pensri, thoroughly enjoy and appreciate this Thai movie. 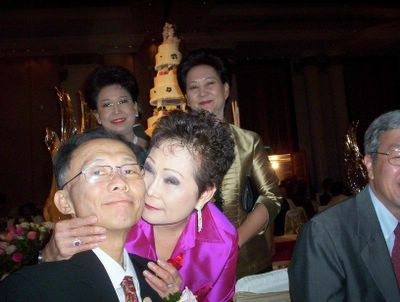 It was Khun Sukree's first time in 25 years to go to a movie theater. 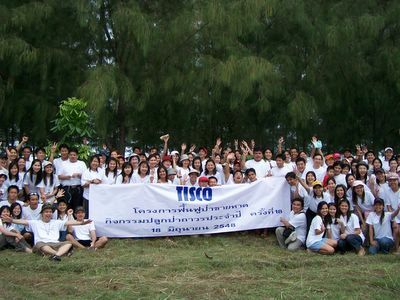 The proceeds from this charity event will go to the TISCO Foundation Tsunami Fund for educational support. 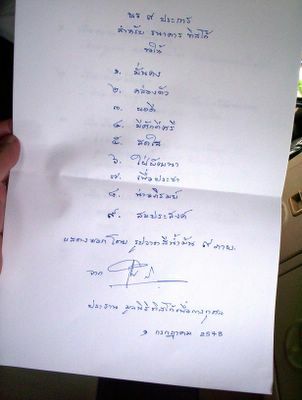 The "Deed of Gift" to TISCO BANK signed by Archarn Kamchorn Sathirakul, Chairman of the TISCO Foundation. 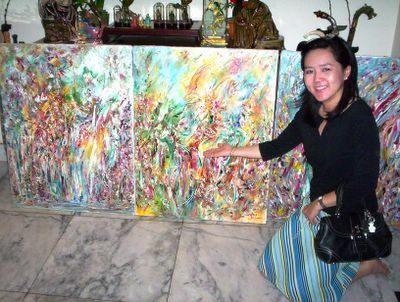 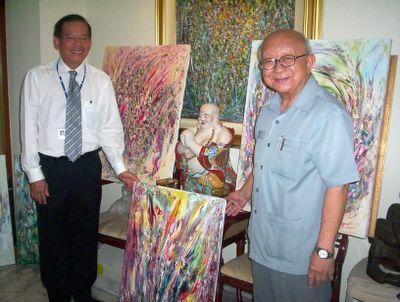 Khun Nartrudee shows the other three significant painting of Archarn Kamchorn which he gifted to TISCO BANK. 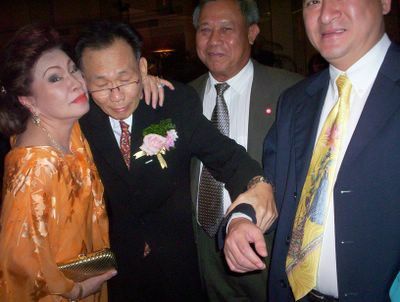 Khun Srisooda kisses Khun Suthep on the occasion of his son's (Dhana's) wedding, with Khun Sasinee and Khun Pattira(TISCO Foundation Manager) as smiling witnesses. Volunteers from all TISCO Group work hard in the falling rain to plant the trees. 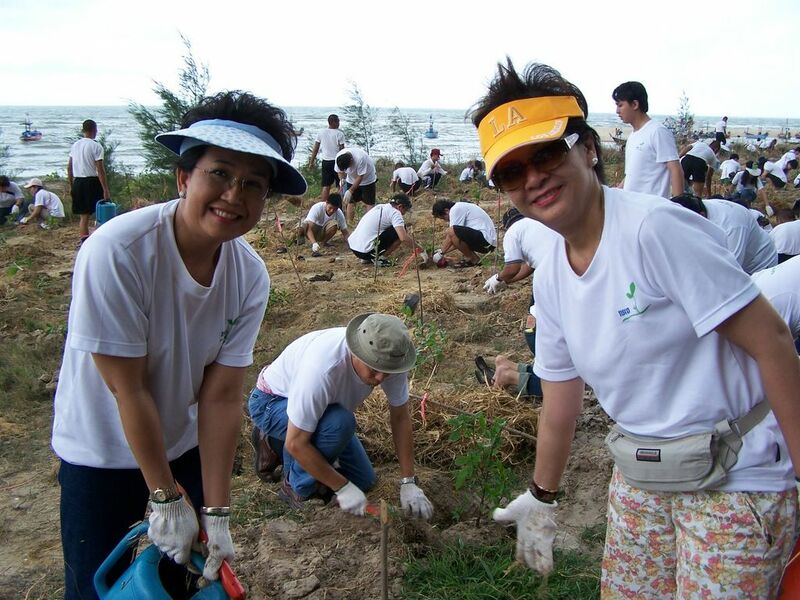 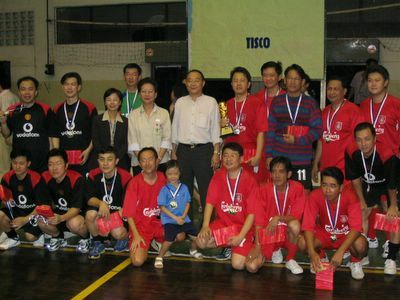 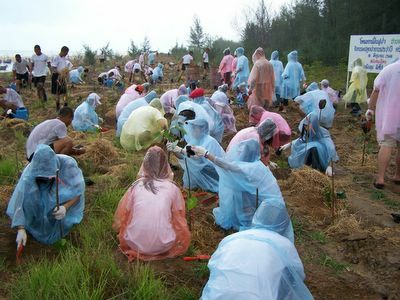 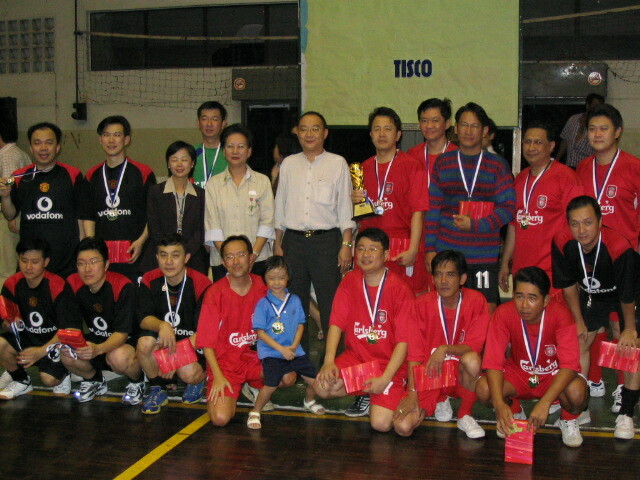 18th Annual TISCO Reforestation Activity on June 18, 2005 at RAMA VI Military Camp, Petchaburi Province. 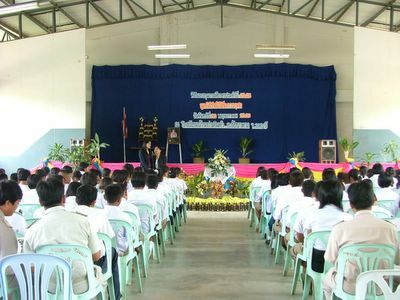 TISCO Foundation Scholarship Distribution Ceremony was held on June 17, 2005 at Nakorn Sawan Municipality Hall for students in schools located in that province. 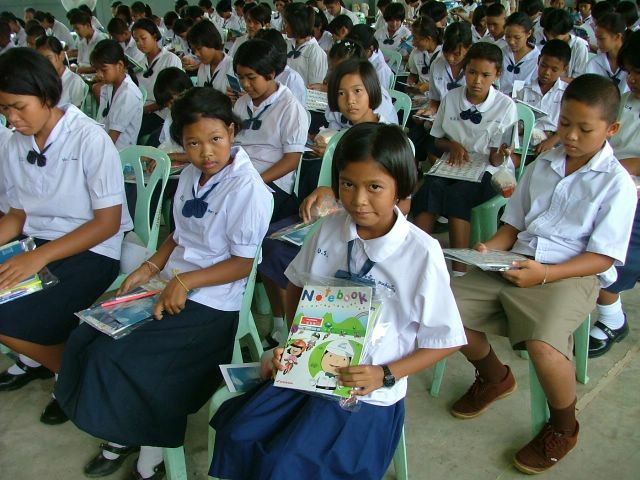 A total of Baht 87,500 in scholarships were granted to 58 needy children in the Nakorn Sawan area. 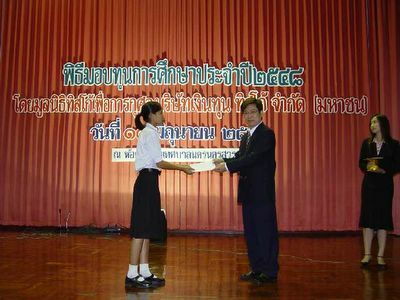 Khun Vasin Sivasirikaroon Manager of PLO Nakhonsawan presents TISCO Foundation Scholarhip cheques. 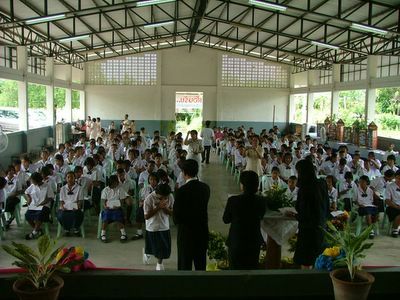 The students happily show the cheques for their education that they have just received. 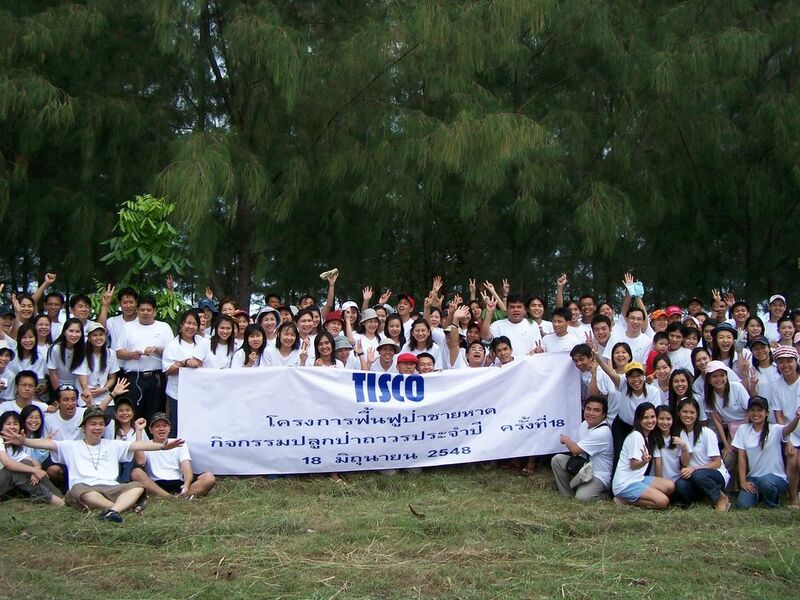 Khun Srisooda and Khun Duangrat, TISCO Foundation Directors, are happy to help the poor students. 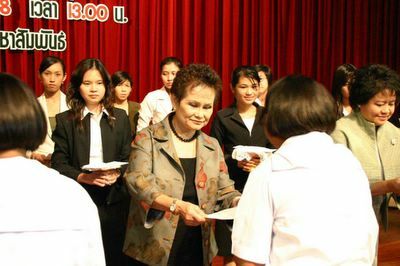 TISCO Foundation Directors- Khun Pliu, Khun Uvares and Khun Vannee present scholarship cheques to the needy students. 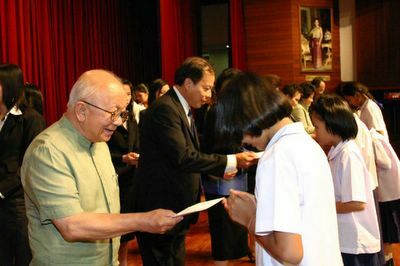 Khun Kamchorn Sathirakul (Chairman) and Khun Pliu Mangkornkanok (Director) present the Scholarship cheques to the qualified students. 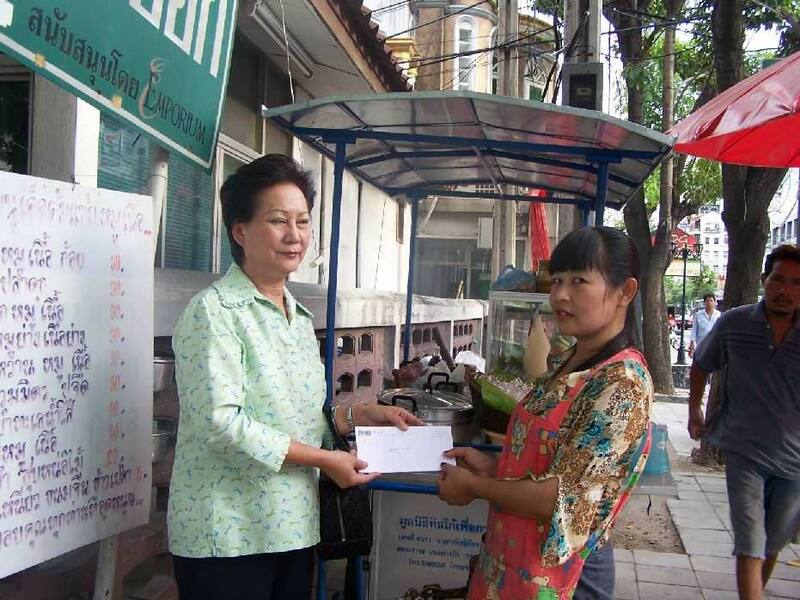 Khun Pattira presenting 2,500 baht Occupational Fund to Mrs.Somrak Suwanno, in addition to the Som Tam Cart she already received from the Foundation. 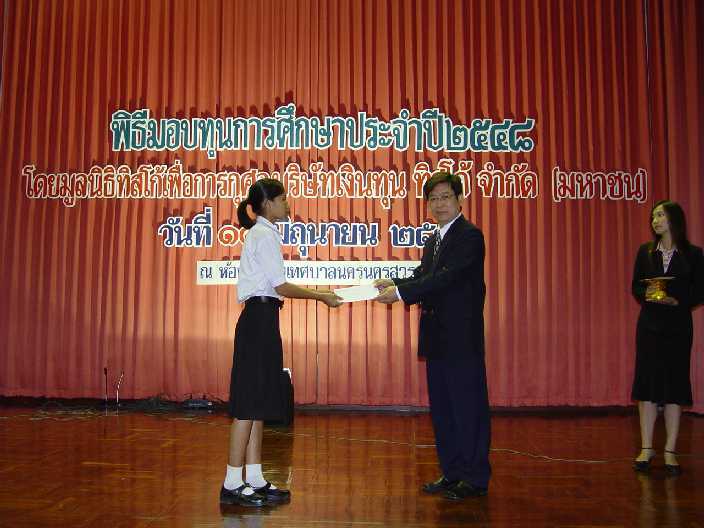 TISCO Foundation distributed educational scholarships to students in over 30 schools located in Lopburi area. The ceremony was held at Ban Ta Din Dum school at Chaibadan, Lopburi Province. 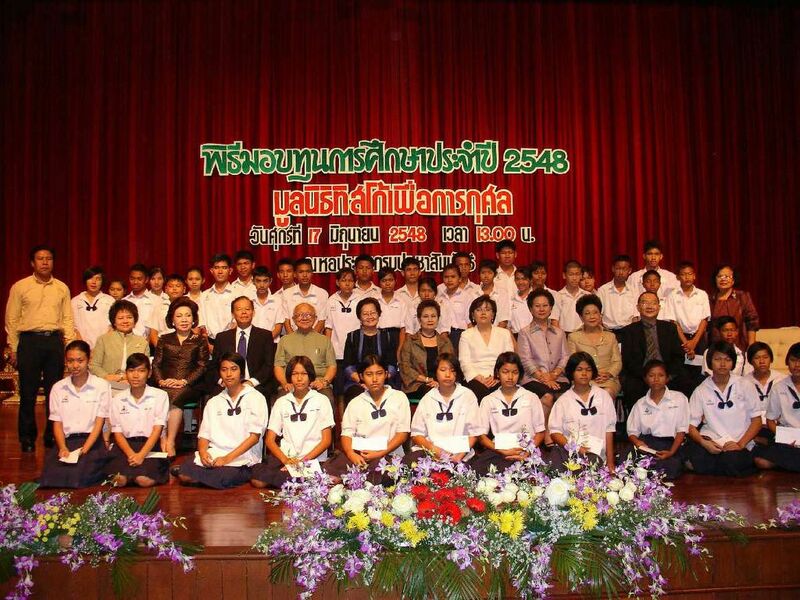 TISCO Foundation directors taken pictures with teachers and students after the ceremony. 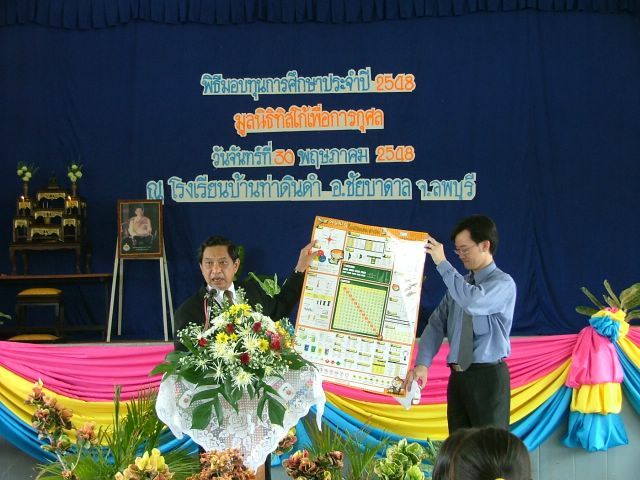 Khun Sivaporn Dardarananda, Vice Chairman, explained the Knowledge Poster to the students at the ceremony. A student smiled as she was showing her gift given by TISCO Foundation.